IN THE HUBBUB surrounding the exclusion of Shane Victorino, the inclusion of Jayson Werth went somewhat overlooked. The Phillies signed Werth as righthanded power insurance against Pat Burrell's foundering. Against Braves lefty Chuck James, Werth started in rightfield yesterday in place of Victorino - a superior defensive outfielder and a switchhitter, but one who is better against righthanders. Unfortunately for manager Charlie Manuel and Victorino, Werth's start came on the heels of controversy. Victorino drew Manuel's criticism after his failed steal attempt of third base with one out and a two-run lead in the eighth inning of an eventual extra-innings loss to the Braves on Wednesday. 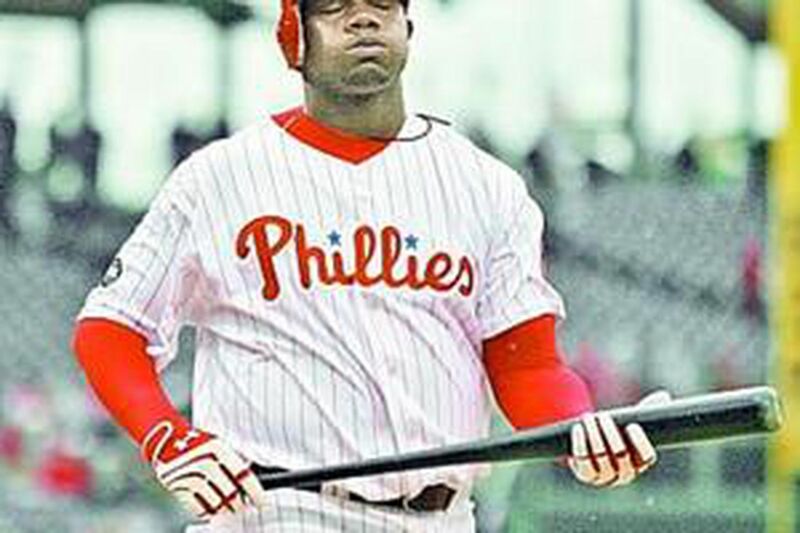 Ryan Howard was hitting, Chase Utley on deck. "The fact that he made a mistake has nothing to do with me sitting him out," insisted Manuel, who called the steal attempt "terrible." "I wanted to get Werth into this game," Manuel said. Manuel had planned on resting Victorino at times this season, anyway. Victorino will be a full-time major league starter for the first time. He is 5-9, weighs 180 pounds and has logged 500 at-bats only once in his eight pro seasons. "I want to play all 162," the plucky Victorino said. Yesterday made sense for him to sit. Victorino was 1-for-7 against James and has looked rusty (2-for-9, three strikeouts) after missing the last 3 days of the preseason attending his daughter's birth. Besides, Werth is a Phillie to play. He signed a $400,000 guaranteed contract that bumped to $850,000 whenever he made the 25-man roster. The condition was included because Werth, 27, fought left-wrist problems since the joint was fractured at the end of spring training in 2005. Yesterday marked his first fully healthy major league season since 2004, when he was an ascending prospect in the Dodgers' organization. He hit .262, but had 16 homers and 47 RBI in 89 games in 2004. Two years and two surgeries later, Werth, who missed all of 2006, believes he has regained the form that persuaded Phillies general manager Pat Gillick, formerly the Orioles GM, to draft him in the first round for Baltimore in 1997. "The last 2 weeks of spring training, things really came together," said Werth, who shook off a slow start to finish at .275. He acknowledged being a little tentative early in the spring. A cage-a-holic, Werth did not allow himself the extra practice sessions that had always been a part of his life until the last few days. The wrist aches when nasty weather arrives, but does not affect him otherwise. "I'm as close to 100 percent as I could be," Werth said. And, so, against a lefthanded pitcher he started. It just looked punitive because Manuel was so incensed that Victorino ran when he didn't need to. "He can score on a single [from second]," Manuel said. "Plus, we've got two .300 hitters standing there. I don't care if it's the first inning or the 28th." Closer Tom Gordon yesterday acknowledged that the week he lost to precautionary rest in spring training has translated into his being a bit behind. "All of my pitches aren't as sharp as I'd like them to be," said Gordon, 39. That's significant, since he gave up a save-blowing, two-run homer in the ninth on Wednesday that forced extra innings and led to a Phillies loss. Gordon expressed no disappointment with the curveball that Brian McCann launched into the rightfield seats, though when the Braves host the Phillies at the end of the month, he expects all of his pitches to be better. He did not pitch in the middle of the Grapefruit League season because of tightness in his right forearm and elbow. The rest did him good, he said. "My strength is good," Gordon said. "I've been really strong, but I've been all over the place. There is no inside fastball, especially to righthanders. I don't want to get up there and hit two or three guys."